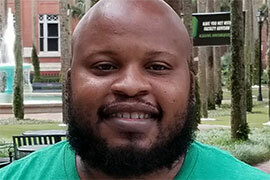 Junior Kenneth Brown, 35, went from “trying to figure out who I am” to receiving a national Undergraduate Transfer Scholarship from the Jack Kent Cooke Foundation. That was as a junior at Sandalwood High School in Jacksonville, Florida, nearly two decades ago and the same year he became a dropout. Fast-forward to this fall, and Brown again is a junior, but this time at Stetson, majoring in political science as a recipient of multiple academic awards, including an Undergraduate Transfer Scholarship from the Jack Kent Cooke Foundation. Nationwide this year, approximately 2,500 students applied for that scholarship. Brown was one of only 47 to receive it, along with admittance into Stetson’s Honors Program. Indeed, Brown, 35, arrived on campus in August from nearby Daytona State College, not far from his home in Palm Coast. Yet, his journey has been so much greater. “I don’t think 18-year-old me would be doing what I’m doing right now,” he said in early November. Brown says he was never a troublemaker and his pursuit of a rap career did, in fact, result in some success. Eventually, though, he realized “that probably wasn’t going to work,” adding he also didn’t like the messages in his music, either. Brown explained that while being a good soldier, he struggled with U.S. foreign policy and left the Army as a conscientious objector, in good standing, a few months short of his four-year commitment and with deployment pending. While talking, he shakes his head, seemingly in acknowledgement that life isn’t always a straight line or an easy path. Following the Army, Brown navigated more winding roads, starting a commercial cleaning company and moving to South Padre Island, Texas — “trying to figure out who I am and what I really want to do.” He married, got involved in social activism and read. Eventually, a return to Florida and the encouragement of his wife brought him to the doors of Daytona State. Brown figured he would take just a class or two, but he excelled on the PERT exam for returning/nontraditional students and received an unexpected note from Maggie Karda, chair of Daytona State’s Quanta-Honors College. That was in 2016. Brown accepted a scholarship offer there and ascended to the head of the class. 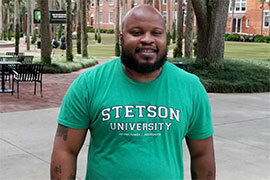 Brown then was set to participate in the newly established Stetson-Daytona State College Select Program, where students receive automatic admission to Stetson plus a Stetson scholarship, based largely on academic merit. That was before receiving the Cooke Foundation award. Notably, the agreement between Stetson and Daytona State is intended to tighten what’s commonly referred to as the leaky pipeline in higher education. Nationally, fewer than one in seven students with an associate degree transfer to a four-year college and earn a baccalaureate degree, according to published data. And even when they do transfer, there typically are multiple academic, social and financial obstacles to overcome. As Stetson and Daytona State continue work on helping students beat the odds, Kenneth Brown has emerged as exhibit A. Now, Brown has a plan. In sort of a “Brady Bunch” scenario, he jokes, he is the father of five biological children and eight stepchildren, with 10 of them living at home, ages 2 to 17. His wife, Lily, is a Registered Nurse who is starting a home-health agency. Obviously, they are busy people. Still, Brown makes the trek from his home in Palm Coast to Stetson four times weekly, including twice on Wednesdays for morning and evening classes. With a purpose. “I have a clear direction in what I want to do,” Brown said. Brown wants to make an impact, and he believes the time and place are right at Stetson. “I understand that in order to affect change, especially change within a society, it starts with politics, with legislation. So, I figured to be the social activist that I ultimately want to be, I need to know intimately how our system works,” Brown explained.